DECKING OIL is an impregnation oil for the protection and maintenance of all exterior wood. Decking oil has a built-in UV blocker, which slows down discolouration of the wood. 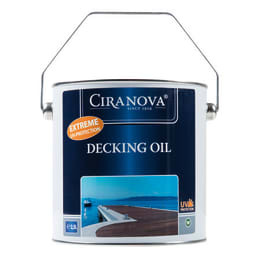 Decking oil feeds and protects the wood and provides a water-resistant effect. DECKING OIL is suitable for all wooden decks, outdoor furniture and sidings. Regular use of Decking oil increases the lifespan of your exterior wood.